Chelsea are monitoring Samir Nasri's situation at Arsenal and could challenge Manchester United for the France international's signature should their pursuit of alternative targets, principally Tottenham Hotspur's Luka Modric, be frustrated. 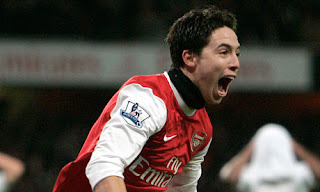 Arsenal have, as yet, failed to convince Nasri to extend his stay at the Emirates Stadium, where the midfielder, a £15.8m signing from Marseille in 2008, has entered the final 12 months of his contract. United are expected to make a formal offer for the 24-year-old, with Arsenal wary of allowing the player to wind down his contract and leave for nothing next summer, but Chelsea are also actively considering stepping up their own interest given the Frenchman's anticipated availability. Nasri is not yet considered a front–line target by Chelsea's new manager, André Villas-Boas, with the club having targeted Modric as their preferred creative midfield recruit. Should that pursuit continue to be blocked, Chelsea will switch their attentions more concertedly towards Nasri.